The hospitality is legendary. Whether you are booking a romantic weekend away or hosting a corporate event, wedding or special occasion, you will find the warm professionalism of your hosts suits the occasion. Matahui Lodge have hosted many guests over the years and Kay and Trevor enjoy providing their guests with enthusiastic hospitality. Many guests on short breaks or overseas travellers appreciate Trevor's local tours customised to suit the desires of the individual. Corporate clients enjoy the seamless service and guests who hold their wedding or special celebration at Matahui appreciate the smooth running and attention to detail that Kay and Trevor bring to the operation. Nothing is too much trouble at Matahui Lodge. 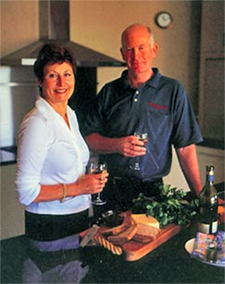 Your hosts ensure that your needs are catered for with tailored menus, excursions and information about the local area. Find out about events at Matauhui Lodge, read testimonials from previous guests, or contact us to discuss your stay at Matahui Lodge. Your hosts, Kay and Trevor.